For the past several years, my husband and I have celebrated our anniversary while traveling. In September, 2013, we were in the Black Hills for the occasion. 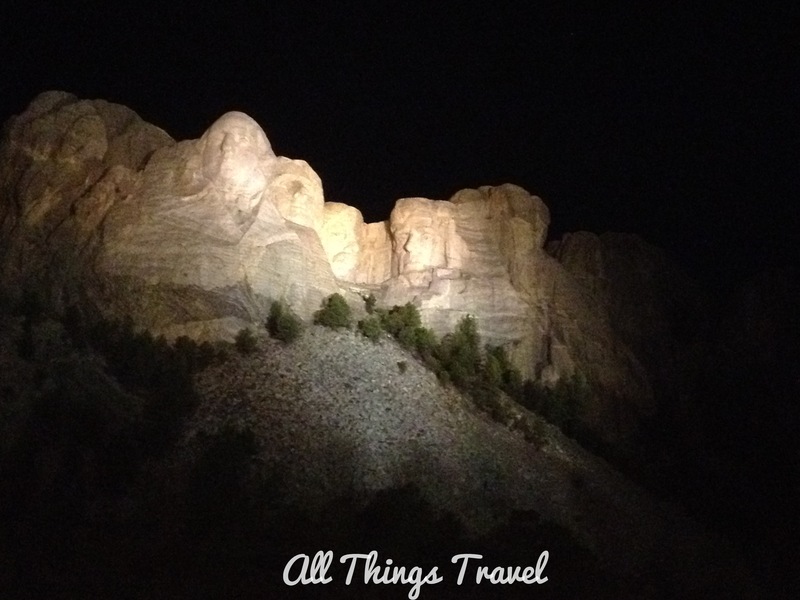 For me, the main attraction in the Black Hills is still Mt. Rushmore and, although this was my fifth visit since childhood, it never fails to impress and inspire me. The idea for a monument in the Black Hills originated with South Dakota State Historian, Doane Robinson, to attract visitors to the state but his idea was to carve sculptures of western personalities. The sculptor he contacted in 1925, Gutzon Borglum, preferred instead to include four significant U.S. presidents, each representing an important period of American history. President George Washington embodies the birth of the nation; Thomas Jefferson symbolizes expansion with the Louisiana Purchase that more than doubled the size of the U.S.; Abraham Lincoln stands for preservation of our union through the Civil War; and Theodore Roosevelt represents our nation’s development with construction of the Panama Canal. I would be remiss not to add a caveat here and mention that Native Americans, particularly the Lakota Sioux, opposed this project as a desecration of sacred Indian lands and Mt. Rushmore was known to the Sioux as the Six Grandfathers. For more information on the Native American viewpoint, check out this link. Borglum and four hundred workers earning $8 per day, blasting the mountain with dynamite and carving into Harney Peak granite, completed the project in 1941, after 14 years including weather and funding delays for a total cost of just under $1 million. The resulting colossal memorial is 185 feet across and 150 feet tall; the faces are 60 feet from the top of the head to chin; each eye is 11 feet across; the noses are 20 feet long and the mouths are 18 feet across. With nearly 3 million visitors per year, there have been necessary improvements and changes over the years to the facilities. The Avenue of Flags, with the flags from all 50 states and 6 territories, was added in 1976 as part of the American Bicentennial celebration and an outdoor amphitheater that holds 2,000 people opened in 1997. Today, there is a parking ramp that charges a fee (currently $11), but entrance to the national memorial itself is free. Each time we visit, I learn something new. I don’t know why I never wondered how Mt. Rushmore got its name, but it was interesting to find out it was named for Charles E. Rushmore, a New York attorney who visited the area in 1885 regarding some mining claims. When he asked the name of the granite mountain, he was told it had no name but it would be called Mt. Rushmore thereafter. When the mountain bearing his name was chosen as the most suitable location for the project and work commenced in 1927, Rushmore became a large contributor. After hearing this information and more at the History of the Carving Talk conducted by the park rangers in the Sculptor’s Studio, we walked the new Presidential Trail. It’s just a pleasant half mile loop among the pines with beautiful views of the monument. Upon leaving the memorial, we drove to nearby Hill City for a totally different activity. We visited three wineries and enjoyed a wine tasting at each. This was obviously a concession on my husband’s part in honor of our anniversary because wine tasting is not something he would ordinarily enjoy. After a highly recommended but unremarkable anniversary dinner at a restaurant that shall remain nameless, we returned to Mt. Rushmore for the evening lighting ceremony. Along the way, we spied a group of mountain goats, a common sight climbing the hills around here. 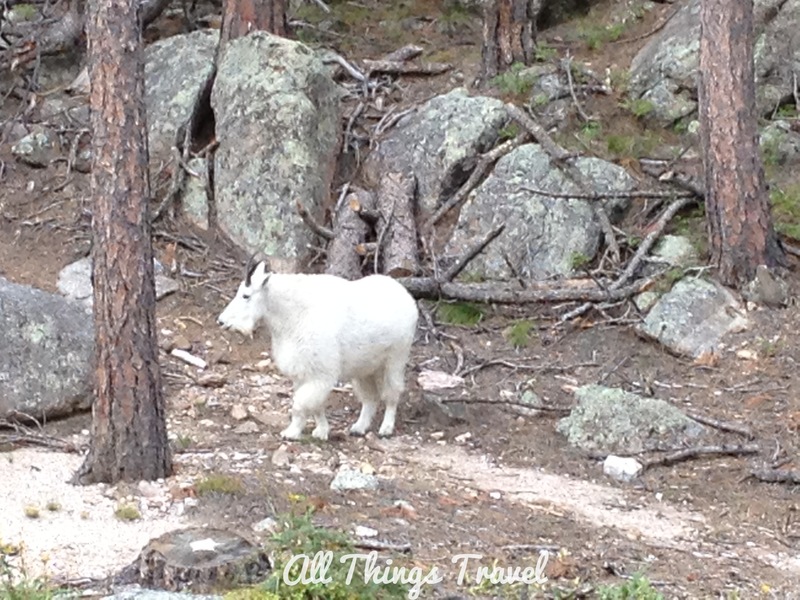 Mountain goats are not actually native to the Black Hills. The original six were a gift by Canada in 1924 to Custer State Park but they escaped their pen and today there are about 200 in the area. Soon after seeing the mountain goats, we observed another kind of climbers– rock climbers of the human variety. Although climbing is prohibited on the sculptures at Mt. Rushmore National Memorial (understandably), other areas of the memorial allow rock climbing. 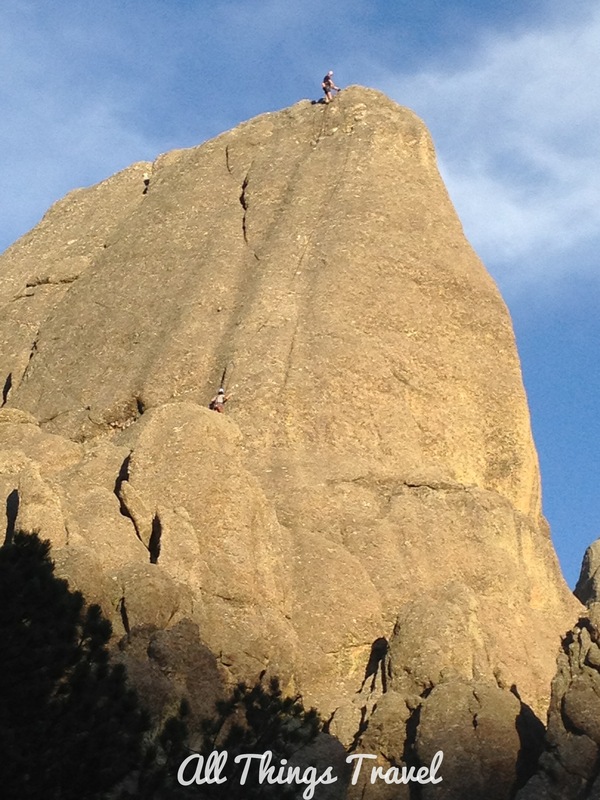 The Black Hills are very popular for this sport and there are many granite walls and pinnacles available for climbs. This is not on my bucket list. We arrived early at the memorial and had our choice of seats in the amphitheater but it soon began to fill in. Beginning at 9 p.m., rangers conduct a program with music, video, and a lighting ceremony. The program, entitled Freedom: America’s Lasting Legacy, includes participation of military and veterans that is especially moving. Do you spend your wedding anniversary somewhere special? Leave a comment to tell us about it. It is an amazing place to visit and you provided some great information about it and how it came to be. Thanks! Sorry about the unremarkable dinner. I guess they can’t all be amazing, right? As for our anniversary this year—next weekend! Will probably spend it at home and maybe just grill out for our dinner since the hubby will be ready for home cooking! Thanks for a wonderful post with lovely pictures to boot! Our most romantic anniversary was dinner at a restaurant on Waikiki beach. We had a delicious meal with amazing service at an outdoor table facing the ocean and our view was a full moon over Diamond Head. Thanks for the post, it was interesting, as always, and brought back a nice anniversary memory.